JUST GOT BACK FROM CHINA, WHICH PROBABLY MAKES ME SOUND LIKE QUITE THE madcap adventuress, when, in fact, just the opposite is true. I'm happiest when I'm home in my nest, a typical Cancer, and traveling is something I tolerate rather than yearn for. My husband, Bill, is always planning the next trip before the current one is even over. This explains how I've reluctantly become a "world traveler" in the 14 years we've been together, as well as why I went to China in the first place, a country approximately 6,000 miles outside my comfort zone. 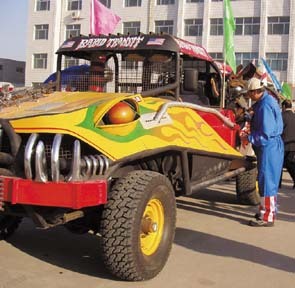 Several months ago, Micki Flatmo, one of my favorite local artists as well as a good friend, invited Bill and me to tag along with 11 other people from Humboldt to attend the Dezhou City First International Strange Vehicles Games in late October. Not surprisingly, Bill was instantly all for it, but it took me longer to warm up to the idea. Over the course of a few weeks, Micki worked on changing my mind, insisting the event was a big deal, on a global scale. Micki told me that Beijing, the closest major city to Dezhou, is changing rapidly in anticipation of the 2008 Summer Olympics, growing and modernizing at an unprecedented rate. The country is also positioning itself to become the world's leading economic superpower, and is opening up to Western investors and tourists like never before. An example of this new spirit of cultural exchange is the Strange Vehicle Games, which was sponsored by Dezhou City itself as well as a major textile manufacturer, the Silverdragon Textile Group. We were told that a "purpose-built arena" capable of seating 20,000 spectators had been built for the games, and 16 countries from around the world would participate, including two teams from the United States, both out of Arcata's Kinetic Lab. Not that the games had anything to do with the Kinetic Sculpture Race. In fact, the Strange Vehicles were supposed to be more like monster trucks -- diesel-powered, four-wheel-drive macho rigs capable of leaping tall buildings in a single bound -- not exactly what you'd describe as being right up the alley of your typical kinetic artist. And yet the Kinetic Race was fundamentally what had drawn the attention of the games' sponsors in the first place. In 1999, Duane Flatmo, June Moxon and Ken Beidleman were invited to participate in Junkyard Wars, a Discovery Channel spin-off of the wildly popular British television program Scrapyard Challenge, produced by RDF Media. The trio was invited because producers of the program had seen them in a film called It'll Have Blinking Eyes & A Moving Mouth, an award-winning documentary by New York filmmakers Jeb Bergh and Steve Fox about our Kinetic Sculpture Race. While filming Junkyard Wars in London, our local kinetic artists became friendly with Richard Curtis, a technical consultant for the program. It was Curtis who e-mailed Duane in May and invited the local artists to put together two teams to participate in the games. Curtis was lining up the contestants for the primary organizer of the games, Zhongqi Sun. Sun, a Dezhou City businessman, an engineer and former contestant on Full Metal Challenge (another RDF production) was hoping to develop a Chinese version of the show in an attempt to promote tourism in his home town. Duane, Ken and June were invited to participate because, as Micki put it, "The Chinese people love artists," and Sun wanted vehicles designed to dazzle the crowds. Each team would receive $2,000 to build their trucks, as well as airfare and accommodations in China. The artists jumped at the chance. 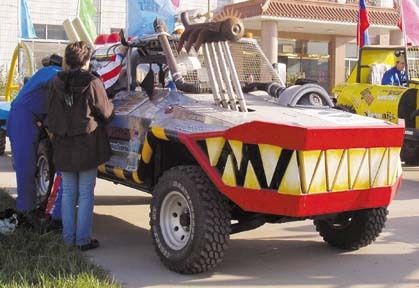 Two teams were formed at the Kinetic Lab: Team "Rabid Transit" -- Duane Flatmo, Scott Cocking (a local graphic designer) and Jerry Kunkel, an engineer from Oregon -- used their money to buy and modify a 1984 Ford 250 diesel 4 x 4. Team "Ramshackle" -- Ken Beidleman, June Moxon and Stock Schlueter -- modified a 1987 B2600 Mazda 4 x 4 pickup. Both rigs displayed that typical Kinetic Lab creative wackiness, but there were serious mechanical problems with the Mazda right from the beginning. At any rate, even with all the information Micki gave us regarding the historical and local significance of the Chinese event, I wasn't convinced a trip to China was within our limited budget or even something I especially wanted to do. Attending what seemed to be a monster truck rally wasn't even something I'd be keen on doing at home, let alone halfway around the world in a country where you were advised to bring your own toilet paper. I researched Dezhou City on the Internet and learned from the city's official site that it was a telecommunications center with a beautiful port and 5.4 million residents. It was known as "the city leading to everywhere." The "three treasures of Dezhou" are watermelons, dates and chickens. Well, that didn't sound so bad, I thought. Still -- the People's Republic of China? I'd never been to a Communist country. Micki assured me that as long as no one in our group screamed "Free Tibet!" in Tiananmen Square, we weren't likely to go to jail. Bill reminded me of the fun group of people we'd be traveling with, nearly all of them artists. He pointed out the potential inspiration. "Think of the stories," he said. "Imagine all the paintings you'll get." I recalled the towering mountain ranges, drooping willows and jaunty magpies in my favorite paintings by Chinese artists, and finally gave in. We got our visas, inoculations at the health department -- where we were cautioned not to drink unboiled water or eat any uncooked fruits or vegetables -- and left for China. Our group arrived in Beijing following a direct, 13-hour flight from San Francisco, unkempt and exhausted, yet brimming with excitement. "China," we whispered to each other, not quite believing it. We picked up our luggage and went to meet our sponsors. "They'll be holding a sign with the SVG rings on it," Duane assured the group, but when we left baggage claim and surveyed the people waiting to pick up passengers, there was no one holding anything that looked like rings. It didn't appear to be an auspicious beginning. "Vehicles that can climb any slope, ford any river and maintain grip on any surface will come together for the ultimate test of man and machine!"